Youve Been Reviewed: Have you ever considered a theme vacation? Have you ever considered a theme vacation? I guess you might have heard of destination weddings? They are all the rage, but not for everyone. How about a theme vacation? That’s something that popped into my brain a day or so ago when I found out a friend is on such a vacation. He goes, or tries to go, every summer to a few big-name amusement parks for the purpose of riding the roller coasters. Not the little bitty kiddo kind, the big adult scary kind. He posts photos on Facebook and just seeing those photos puts my tummy in knots! He and a few of his buds enjoy it and they always have a great time. You may have heard of the 80-something year old couple who had visited all but one Cracker Barrel restaurant (I think by now they did visit that last one in Georgia!) You might not be a CB fan but perhaps you are into pizza. Why not do some research and find several of the top pizza joints and try them out. Just think, you won’t have to worry about what to order – just order the same item in several different restaurants! We often pick our vacation destination this way. If I find some great sounding restaurants that might get us riding in their direction. Such was the case for our recent trip to Murphy, NC. A good start would be a theme vacation to the museums in New York City, or Chicago, or any city that has well-known, or very interesting, museums. Again, you would have to do research on that since everyone has different ideas of what kind of museum they would like to see. And don’t forget the small towns across the US. Their museums may not make the top 10 but they might be just the ticket for an interesting vacation. That would be a major league vacation – to visit every AL or NL (or both) ball park in the US (and Canada). I am not much of a baseball fan but I have been to two parks, one the infamous Yankee Stadium in New York and one many years ago in Baltimore, Maryland. Don’t think this is just for men, many women are very into sports! There are so many popular beaches up and down the east coast, west coast and gulf coast you might have to pick one region of the country at a time! For the east coast, there is always the ‘Jersey Shore’ and its fine beaches in Point Pleasant, Seaside, Long Beach Island and don’t forget quaint Cape May. Venture south to Maryland’s Ocean City where I have spent time in previous years. Further south to Myrtle Beach in South Carolina to …. well, you get the point…just look at the map, there are lots and lots of beaches. There are so many theme vacation ideas I’m sure you can come up with a few of your own. 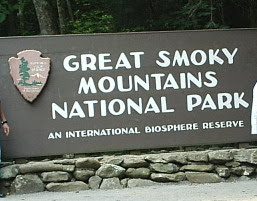 If you are tired of the same trip to your local hot spot every year, try one of ours in Tennessee, like the Smoky Mountain National Park! You can't visit the park without taking a photo of the famous sign!